Time for another recipe! This week it’s cake again, because I’ve been baking a lot lately for my friends on my meditation course, and because, well, cake. This week was our final meditation session (and I’ll post about my experience in a few days) so I thought I’d better pull out the stops. Rhubarb and ginger is another of my all-time favourite flavour combinations. I am a huge fan of ginger anyway, in whatever form. When I bought a juicer last year I took to juicing a shot of ginger instead of a morning espresso … sounds crazy but boy it wakes you up in half the time and gets your veins zinging in a way you never though possible. I highly recommend you try it. I love grating it into my porridge, or into smoothies, and I even love a slice of it in hot water with a slice of lemon in the mornings. When we harvested our pears from the garden last year there were so many I simply couldn’t bake enough pies or crumbles to use them up so I made pots and pots of pear and ginger jam which is also a brilliant combination and is my favourite thing on toasted crumpets. So, yeah, I love ginger. I also love rhubarb like you would not believe, the tangy, sweet yet sour flavour and the amazing texture are just so different to everything else. We’ve planted some in the garden and I really can’t wait for it to be ready, but for now I had to make do with shop-bought, which, let’s face it, is all most people can get and tastes pretty great too. And paired with ginger that brings an extra zing, it tastes even more wonderful. Maybe the reason I like rhubarb best though is that it reminds me of my Grandpa. I remember him coming into our kitchen with huge long stalks of rhubarb, ten or so at a time, and expecting my poor Mum to make crumbles and pies for the rest of the day, only to do it again a week later! He was a prodigious rhubarb (and everything else!) grower, and all around the garden and farm could be found old metal dustbins covering up his precious rhubarb plants. I remember very clearly once when I was very small, I had an ice cream and thought I would be a good girl and throw my stick in a rubbish bin instead of just leaving it somewhere. I saw the nearest bin, lifted the huge metal lid, and dropped it inside, cue a huge roar from my Grandpa: “You silly girl, that’s not a rubbish bin!” He then showed me what was inside these mysterious bins and from then on would always invite me to go and check on his rhubarb with him, probably to make sure I didn’t throw anything else in there! One day when I have my own garden rhubarb will definitely be a feature, though I may just let it grow unforced, or perhaps think of a more decorative way to cover it than rubbish bins! This cake is messy, I will warn you. Crumbs (or crumbles) will get everywhere if you try to pick up a slice and eat it in your fingers. I recommend a plate and a fork for this one, or in the winter, warm it in a bowl and pour over some hot thick custard – the perfect comfort food! I still feel a little bit guilty about the effect this cake had on the carpet of my meditation coach (or guru!) Tony. Sorry Tony! 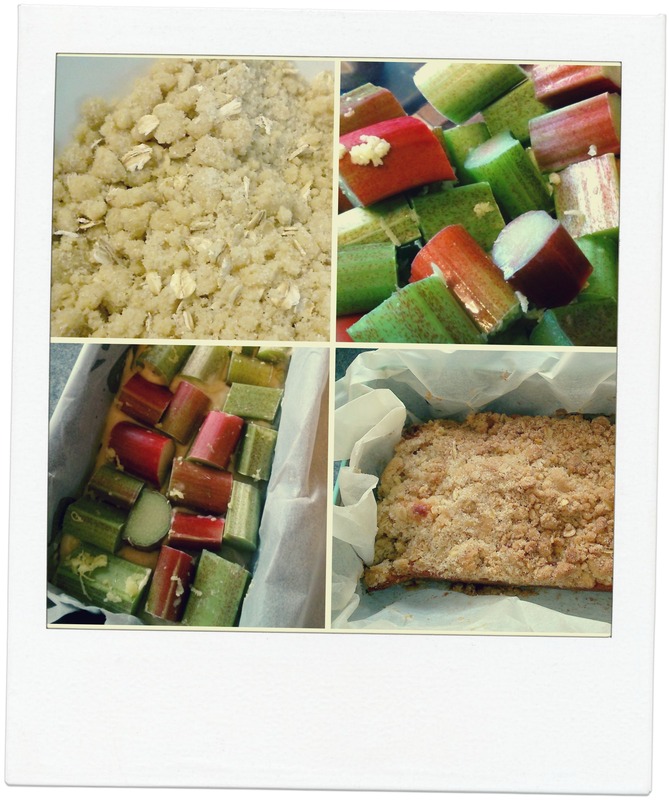 Despite the messiness, it went down a storm, the verdict was something along the lines of perfect moist sponge with crunchy crumble and tangy rhubarb, but it came out more like “Yum, delicious, mumble mumble (mouthful of crumble) really, yum”. Best of all, as with all my cakes (because I’m a busy girl after all! ), it is super quick and easy! 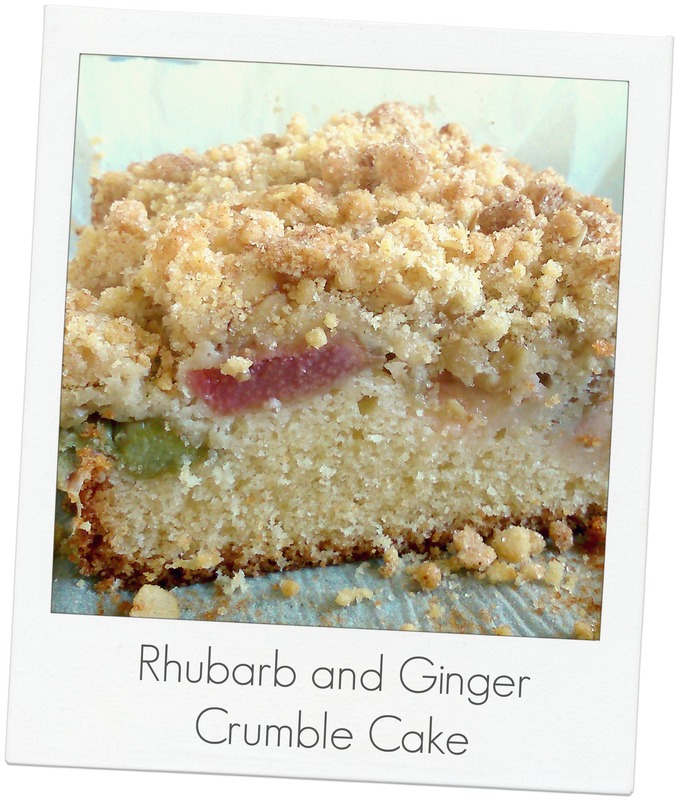 So no excuses not to give it a go next time you come across some rhubarb! I’ve used fresh grated ginger in the recipe, but you could equally substitute this for powdered ginger (1tsp) and it would taste just as great, but if you’ve got fresh, I always think it’s nicer to use it. Preheat the oven to 180c/Gas 4. Grease a cake tin (I used two medium loaf tins (so there was enough for the boys at home!) but the recipe calls for a 23cm spring-release tin). Mix the rhubarb and grated ginger together in a bowl. To make the crumble topping, sift the flour and ground ginger into a bowl. Rub in the butter until the mixture resembles coarse crumbs. Stir in the sugar and oats and set aside. Sift the flour and baking powder into a bowl. Add the butter, sugar and eggs. Beat well until the mixture is smooth, adding just enough milk to make a soft dropping consistency. Spoon the mixture into the prepared tin and spread level. Cover with the rhubarb. Sprinkle the crumble topping over the rhubarb. Bake in the oven for 1 hour until firm and golden brown. Allow to cool in the tin. Slice, eat, heaven! Let me know what you think! Do you love rhubarb as much as me?! I have proof this recipe is a good’un! 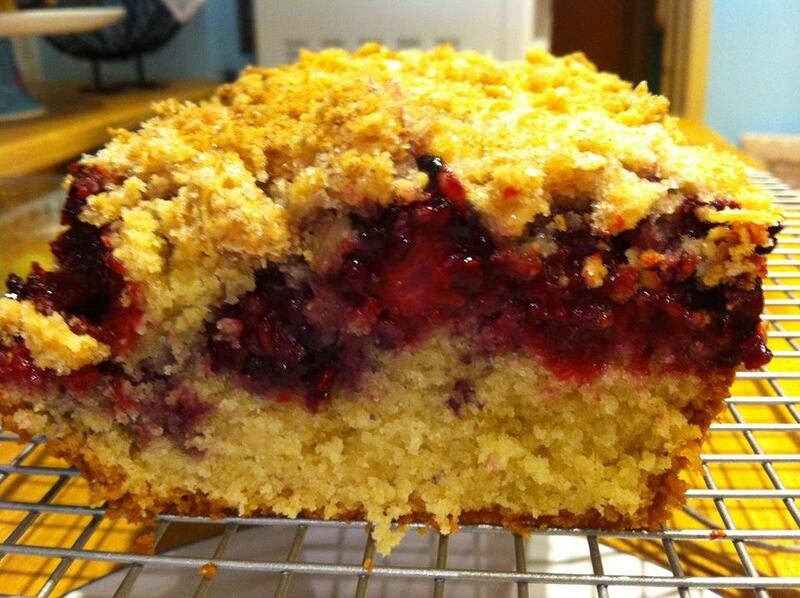 My friend Holly made the very same recipe with blackberries, and dare I say it, hers looks far superior to mine! Thank you for having faith in my recipe Holly, and I shall be coming to you for baking tips in the future! Thanks Sophie! Just had a look at your blog – some wonderful writing, and that header is spectacular! How did you make it? Ha ha! Thanks Elaine! I always think my food photography is rubbish but who cares with such a delicious looking cake, right?! Not rubbish at all! But yes, I know what you mean!! What a lovely cake, Anna! YUM. Forget about the crumbles, I’m picking this up with my hand, lol. I like fresh ginger in everything, and I am sure it gives this cake a nice flavor. Happy weekend! The cake looks beautiful, I love rhubarb and it’s so nice that it reminds you of your Grandpa. I just love crumb cakes and am now dreaming about serving it warm with custard poured over. YUM! Yep, I think warm is definitely the best way! Rhubarb and custard is a pretty great pairing too of course!